Wrong, wrong, wrong—we had Hungary pegged all-wrong. We think of countries in clusters, either because of history, culture or economics. “Germany & Austria”, “Poland & the Czech Republic”, “Turkey & Greece” (they would both hate to hear that! ), and “Hungary, Romania, Bulgaria, & Albania” have been natural groupings for us. Those last 4 have long been lumped in our minds because of proximity and because of our understanding of their position on the ‘transitional economy yardstick.’ I am not yet sure with what countries we should be clumping Hungary, but the “Bulgaria, Romania & Albania” group ain’t where it belongs. Economically, Hungary is a happening place and has been since the 1970’s. Like the Yugoslav republics under Tito, Hungary’s leaders found a little more wiggle room under the Soviets than did the governments in most other Eastern Block countries. Yes, people paid for that wiggle room with their lives, like the 27,000 that were killed in the 1956 Uprising for independence. But by the 70’s, Hungarians were enjoying a higher standard of living, more freedom of movement and more ability to criticize the government than their Soviet-satellite neighbors. Consumer goods were still in short supply but not as desperately so as elsewhere. And it was the September 1989 decision by the more progressive Hungarian communist leaders to cut-down their electrified fences and thereby release a flood of desperate East Germans into Austria that paved the way for the more internationally visible and remembered crumbling of the Berlin Wall and collapse of the USSR. 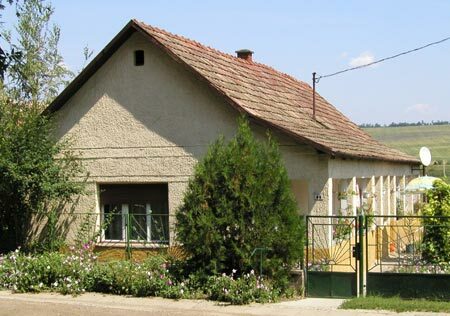 The standard of living in Hungary is unmistakably below that of Western Europe but they are clearly “moving-on up.” Most of the exteriors of the home are in need of repair, such as new windows, patching the surface coating on the walls, and a new roof in not too long. But their maintenance efforts have been enough to make their dwellings look lived-in—much more so than in the Czech Republic--and there’s a lot of building and remodeling activity. Most of the Hungarian homes are the typical earth-brown that I now think of as the favorite decorating color of the Soviet sphere countries. The dull, dreary houses blend with the soil and have become mottled and streaked over the years. But in the midst of all this heaviness we will occasionally happen across a proud “look at me” house that seems like it was clipped out an Austrian version of “House Beautiful” magazine. The brand new red tile roof; the flawlessly textured and fresh, sunny-yellow paint with white trim; a bit of new woodwork in a fence or eve decoration; and hanging baskets of blooming plants are so inviting. I can imagine the cheeriness of those few charming, remodeled homes makes others want to quickly follow their lead. In addition to the slow tipping of the balance towards significant home improvements, it looks like there is an infusion of money into all of the villages we cruise through. How the money is spent must be in part up the regional government as what’s being done varies in broad sweeps. In the west, we noticed that each new village was getting inviting, new wooden playground equipment and some were even getting a new park for it--in several towns we saw the workers finishing up the projects. Other villages were getting much needed, high quality bus shelters to replace those frayed particle board relics. North of Budapest we suspect that the new sewer system may be the village’s first as the prevalence of front yard wells suggests that municipal water may have been a recent addition. And a bit north of this town we were greeted at each city limits with a new “Welcome to our village/town” sign in English and German, complete with the municipality’s colorful coat of arms. In other towns we’ve seen lush, new parks with new memorial statues and plaques; freshly paved main streets; and new civic buildings. It is heart warming to see that even the small villages are being pulled along as Hungary picks up speed and yet the regions seem to be in charge of putting their own spin on the upgrades. One of the aspects of this moving-forward Hungary that makes our heads spin is the prevalence of mud-brick homes. After seeing enough of them that have sloughed all or part of their protective stucco finish, we are realizing that we have gone through many villages of almost exclusively mud-brick construction. The long, narrow 1920's 'clone' mud brick house in Hungary. Hungary must have had quite the building boom in the 1920’s and early 30’s as we see street after street lined with 2 basic house styles, a few with dates under the eves. One is a long, skinny house with a very narrow covered porch running the length of one side. Often there is a cute little archway at the street end of the porch and it looks like a very modest sized dwelling. Then there is the much larger square house with a pyramid-shaped tile roof with 2 large, square windows on the street side. Usually these houses are clustered with ‘their kind’ so there will be long rows of one style or the other, or whole villages of mainly one style. And we strongly suspect that every one of the houses of these 2 styles is made with mud brick. Elsewhere in Hungary we came across recently redone exhibits that were small but wonderful presentations, especially some Roman archeological sites. The older museums and exhibits are pretty sorry looking assemblages of ‘stuff’ and the new ones are thoughtful and delightful exhibits—another indication that Hungarians have enough affluence to slowly start upgrading their public sector displays. Our experience-driven, more accurate assessment of Hungary is also reflected in our sense of personal safety. We thought Hungary was suffering from economic despair like Bulgaria, Romania and Albania (or are we wrong there too?) where people are hungry. And as central European’s remind us, hungry people make it less safe for everyone. Organized crime doesn’t affect tourists much, but hunger does. Our concerns about roadside banditry in the other 3 countries have been echoed by Europeans who have been there and we had been carrying that concern over to Hungary. But the ex-trucker in Austria was very clear that Hungary wasn’t like that—that it was fine. And everything we have seen supports his assessment. We will keep looking for more current information about Bulgaria and Romania to make sure our fears are still founded for those countries as Map Man has a little route from the Black Sea that he has had to put on the shelf because of safety concerns. 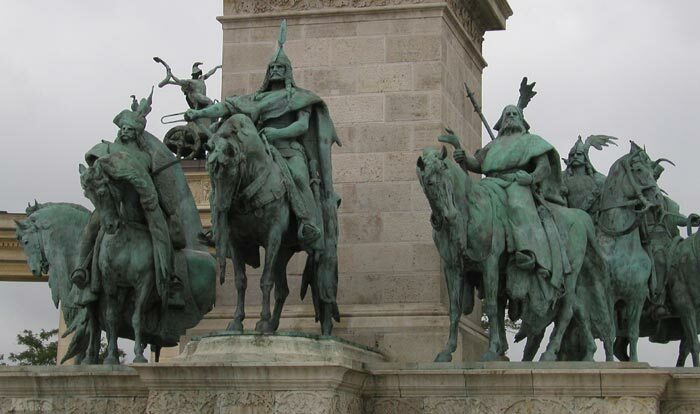 Bill loves this statue of Arpad the Conqueror and his 'buds' in Budapest's "Hero's Square". & not quite visible, 1000 yrs since Arpad. Before arriving in Hungary my slate was pretty blank as to what it would be like. “A struggling former eastern block country that got it together enough to be in queue to join the EU” was about it for my preconceptions. But now if you say “Hungary” to me “Magyar, Arpad the Conqueror, the Turks, 1848 and 1956” are what come to mind. “Magyar” is their preferred word for their language and culture, “Arpad” was one of the invading Magyar tribal leaders that conquered the land for his migrating people in the late 800’s ce, and “the Turks, 1848 and 1956” represent unsuccessful struggles for independence. Those are names and dates that come up over and over again—more so than WWI, WWII or the collapse of communist rule in 1989—and those are the imprints on my brain when I think about Hungary. And I have to congratulate the Hungarians as the items that flash in neon for me are all historical events. In other countries I become fixated on the piles of roadside garbage, the sad plight of their dogs, the pleasant or unpleasant demeanor of the people, or the importance of always having the right coins and TP for the toilets. In Hungary, the general civility around me allow those other issues to fade into the background and instead I am remembering the history that is most important to them. The remains of Roman cities, Ravenna’s dazzling Byzantine mosaics and Otzi the mummified mountain man teach us by being boldly before us. But it is also interesting to watch what we learn by noticing what is missing. 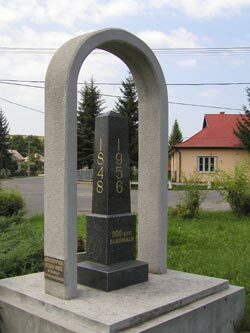 In Hungary, it’s the Hungarian though not Soviet, WWII war memorials that were missing. Presumably the Soviet regime didn’t allow them as they abruptly started appearing upon the collapse of the communist government in 1989 (as did monuments to their struggles for independence in 1848 and 1956). Unlike almost all other memorials we see, the installation date is noted on these that were so long delayed—emphasizing what was missing for 45 years. 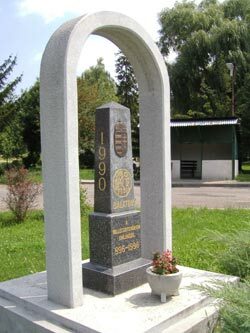 A rare-for-Hungary combined WWI and WWII memorial so weathered that it was probably put up before 1989 also revealed by what the Hungarians felt was missing, which was the ending date for WWII. They only noted the beginning of the war and left off with a “--“. In addition to the missing buildings, one third of Hungarians are missing from Hungary--they left the country in the 20th century due to a series of disruptive political events, including the division of the country after WWI, the grip of communism causing people to flee, and the crack-down after the 1956 Uprising. “What is missing” at the ever-sadly neglected Hungarian village Jewish cemeteries speaks volumes—the absence of any burials since 1944. The Jews were relatively safe in Hungary until the summer of 1944 when the government’s attempt at negotiating a separate peace with the Allies resulted in total occupation by the Nazi’s and an implementation of their deportation and extermination policies. Not only did the burials cease but so did the upkeep of the cemeteries for lack of heirs. Budapest didn’t win our hearts as we had expected it to, but it’s not easy for a big city to do. Cities are always a rude change in tempo and scale from our lower-stimulation countryside lifestyle. We appreciate the human-scale quality of smaller towns and cities where we can easily walk to the market and the museums and get a sense of the historical part of the town on the first day’s visit. The challenges of learning a big city’s public transportation system and fitting together satisfying sightseeing plans with varying closing hours and days is shockingly rude in comparison to our more simple-minded pedaling and small-town days. 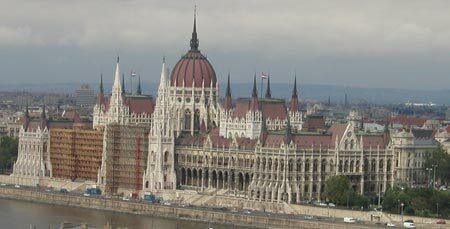 Budapest's late 1800's Parliament building (with scaffolding on the left). But big or small, we make staying in the heart of the old town a priority which usually helps in getting to know a city. But Budapest with its 2 million people and its sprawling sights didn’t yield to that strategy (we even divided our nights between the heart of old Buda and the heart of old Pest). Our guide book commented that the best museums were pretty much altogether but the ones that caught our eye instead look like points on a compass--OK, so not everyone wants to visit the Foundry Museum. It seemed like it would take weeks to feel satisfied with our visit to Budapest and yet we knew that we’d be itching to be pedaling in the countryside before then. On Day 6 we finally surrendered to a city bus tour to get the overview we still had not grasped on our own. 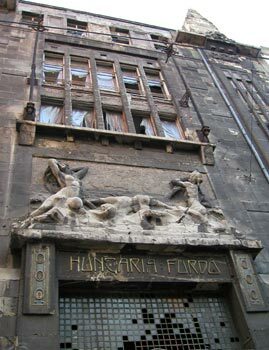 Unlike Prague where a satisfying number of its delightful Art Nouveau and other interesting architectural pieces are condensed within a part-day walking tour, our guide book overwhelmed us with 12 walking tours of Budapest. We finally gave up on the walking tour idea and settled for what we saw as we headed out for our top-picks from the museum list. The late 1800’s were the time of the most recent golden-age in Budapest when a conscious decision was made to rival Vienna and Prague as a cultural pinnacle. The spurred building boom included the excessively massive and ornate parliament building, the first underground transportation on the continent (London’s tube was the first in Europe), the first suspension bridge on the continent, their bronze statue-laden Hero’s Square and hundreds of flashy public and residential buildings. The ornate facade is all that remains. But this once-grand Budapest has yet to recover from the challenges of the 20th century: the world wars, civil wars, and the long-held grip of communism visually dominate the streets. Still standing in the city’s heart are shells of buildings that we assume were damaged in WWII. The ornate façade stands but the entrance and lower windows are bricked in. Shreds of plastic that once covered upper windows flutter in the breeze. Rusted rebar with attached concrete clumps precariously dangle off the end of the remnants of several stories. There are grand but vacant buildings scattered along our daily routes through the city. 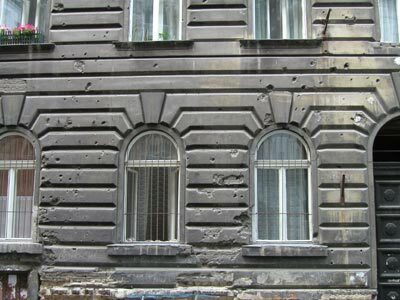 And many plaster and stone facades still display the deep, cone-shaped shrapnel holes of fighting in the streets from WWII or the 1956 Uprising. And heavy communist-era brown buildings are scattered amongst the mix of unrestored and restored historic building and more modern structures. The broad sidewalks of the golden-age boulevards that were built for the late 1800’s upper middle class to promenade upon aren’t packed with people and they don’t throb with activity like in many cities. And rather than bumping into pockets of snooty high fashion divas, most of the residents out and about are dressed very casually and very low budget--like they just moved in from the village. In the 10 days we spent in the city I only saw a couple of men in suits and ties. Of course, the more casual and less-pressured atmosphere on the streets makes it more comfortable for us as visitors but it is a startling contrast to other large European cities. It’s a curious time warp to see the more provincial lifestyle reflected on the sidewalks with these grand and once grand buildings of an elegant, bygone era as a backdrop. The juxtaposition of grand and humble is still being created in modern Budapest too. Our first accommodations on the Buda side of the Danube (west) were across the street from a huge new mall called Mammut. The merchandise price-point isn’t top end, but it definitely is a modern mall bringing consumerism to the enthusiastic Hungarians in a big way. But integrated into several stories of the back side of this shiny, slick mall are tiny, grubby shops with dirt-cheap merchandise and a huge open-air produce market. The 2 faces of this mall complex couldn’t be more different, which is emphasized by the lack of indoor link between the 2 worlds. Still-prominent shrapnel holes seen from our hotel window. Like elsewhere in Hungary, the people in Budapest aren’t outgoingly-friendly but invariably will take the time to help if asked for directions or information. And the cyclotourists we see that appear to be Hungarian by their gear never stop to chit-chat and rarely give an acknowledging nod as is done in some other countries--some even look away as they pass. We have however gotten a few waves back from ‘roadies’ (guys on racing-styled bikes) out on training rides. Like the cyclist’s apparent road etiquette, the breakfast room demeanor is one of privacy in Hungary. In Germanic countries the breakfast room tradition is to give quick but acknowledging “Good-morning” to everyone as you enter the room or pass by seated individuals, as you would say “Hello” to a shopkeeper. It’s a ritual that seemed a bit forced at first but one we have come to appreciate for the inclusive atmosphere it creates. In Hungary, it is the opposite as people move about the breakfast or common room as though they were the only ones there. We do keep bumping into little remnants of a bygone mindset that we assume is Soviet-era. I’ve been in more than 1 market where the check-out line extends half or more of the store length and the clerks have few resources if they have a cashiering problem. Making the customer wait seems quite acceptable and the customers appear used to it. And we have been in several situations where there are staff people that seem redundant, that they appear to no longer have a function (perhaps just a strong union?). In parts of Hungary and some other eastern block countries we have been dazzled and impatient with the detailed and entirely predictable bookkeeping maneuvers that are done at check-out time. Clerks will have to go through elaborate calculations, tabulations and recording of taxes when the only expense has been the posted rate of the room with no extra charges--at the very least they could prepare these before the guests start stacking up at check-out time. And then there were the exceedingly and uncharacteristically rigid staff at the large Roman site on the outskirts of Budapest that were so unhelpful with our bikes. We arrived there on our second trip into Budapest with all our gear on our bikes, having previously checked its safety for leaving our gear at the gate. Heavily loaded bikes usually don’t fit in bike stands and stands tend to put too much torque on the frame even if the bikes do fit. So loaded bikes need to lean their heavy rear-ends on something like a wall or a post. But the staff refused to let us put our bikes anywhere but on the bike rack. Being the only bikes there we managed by using the one available end of the rack, but it was barely workable. The family of 4 traveling by bike turned around and left when they were told that they couldn’t lean their bikes on a sturdy iron fence. We really felt like we were in the den of the ‘old guard’ as everywhere else the Hungarians have been exceedingly accommodating about our bikes and in similar settings will even keep our bags in their office. I’d love to know if the unarmed security men we see in nearly every store are a holdover from the suspicious times of the past or are a reflection of a high level of crime. The guys wandering around the grocery stores are the only vigilant guards and they stare and scrutinize enough to make me uncomfortable while I shop. But in other places the security men are sleepy-eyed and useless looking—like the one reading the newspaper in the tourist info office where everything touchable is free. We’ve occasionally seen prominent store guards in other countries but they seem more numerous in Hungary. A Budapest sidewalk sight that makes us both wince and wonder is that of everyday sort of folk peddling a few items on the sidewalk. It must be illegal as they nervously look about and only have an item or 2 out of their shopping bag at a time. A withered old woman was selling commercially bagged pasta—just like what is on the grocer’s shelves. A bit younger but still elderly man was selling small bouquets of unremarkable roadside flowers. But the majority of clandestine peddlers are middle-aged women holding a pair of new briefs or a very inexpensive print housedress in front of themselves as they deliver a non-stop sales pitch to all of us on the way to the market across the street. I assume that it is their way of making ends meet, of earning a little bit of tax-free income. With the few items they sell and a presumably tiny profit margin it seems a pitiful way to spend their time. We are accustomed to the equally sad sight of young African men selling cell phone covers and CD’s from rickety old baby strollers or home-made cardboard displays in most any major European city but this is the first time we have seen the mainstream population hustling in such numbers on the street corners. Despite the apparent struggle of some to make ends meet, the Hungarians enjoy a little quieter life than much of Europe. Use of car horns is banned except for dire calamities, emergency vehicles notch-down the volume and duration of their sirens, and in general the amount of clattering and banging is lower. The rare blaring of music or TV’s is measured in minutes, not hours. 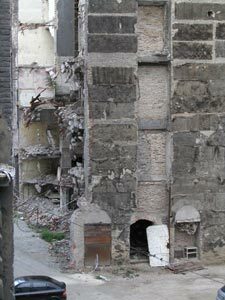 Both of the rooms we stayed in were 1-2 blocks off busy thoroughfares, one in Buda and one in Pest, and yet the city noise level was low enough that we were able to sleep with the windows open. And even though we managed to visit some of the most heavily polluted cities in Hungary we didn’t find the air pollution to be objectionable. That is especially impressive as my lungs are very reactive to hot-summer-day pollution and most of our days in Hungary have been in the high 80’s and 90’s F.
Unlike in western Hungary, we are seeing the deeply tanned homeless and mentally ill people wandering the streets and hunched on park benches in Budapest. And as the urban life creates space for the homeless, it is also clearly creating a greater challenge for the still-invisible workers that keep the grit and litter out of sight, though they are still doing well compared to the performances of other big cities. Over all most of the people we see on the streets of Budapest project and happy, confident look that seems to have a substantial basis. The availability of tourist information varies widely from country to country. In Greece, tourist info offices are all but non-existent. In Italy, the offices are plentiful and usually have excellent material but their small-region approach and unpredictable hours make their system aggravating to use. Croatian tourist info offices, even those located outside the country, are prepared to send you out the door with armloads of brochures, maps and information and sometimes even a pen and cloth bag to stuff it all into. But in Hungary, the emphasis is just on getting you out the door. We are consistently stunned at how ignorant the tourist info staff is in the Hungarian offices. On our way to and in Budapest we inquired several times about what turned out to be fine small museum and archeological site listed in the Budapest-area tourism brochures and nobody in the info offices or at the hotels had heard of it. As far as they were concerned the town had nothing of interest to tourists. Most of our other questions received a shrug and went unanswered. And sometimes hotel and B&B staff can be a wealth of information but that sure isn’t the case in Hungary. I imagine we would get as much help or more from stopping a fellow tourist on the street as we do when asking the tourism professionals here. We were also amazed at the unhelpfulness of the staff at some sites. One outdoor museum had a video within a 2700 year old, Hallstatt-era reconstructed burial tomb. Luckily a Hungarian couple had been invited to view it when we stumbled in. We noticed that English was one of the 6 languages available and decided to return when the couple left. We weren’t quite quick enough and the young cashier locked it up before we got to the door. Only with prodding were we allowed in. She didn’t tell us about it when we paid the entrance fee and apparently hadn’t intended to make it available to us. Weird! In Hungary, we paid $20-26/night for a pleasant room in the touristy, resort areas and the price doubled or more when we were in the towns and cities, with little in between. We were sure that the flood of international tourists into the lake resort areas would drive the prices sky-high, but that definitely wasn’t the case. In Budapest, we paid $40 per night for a so-so hotel room but $70 per night for a thoroughly modern double’s room in a youth hostel (nope, I didn’t reverse those.) It is of course easy to spend much more in Budapest. We saw a couple of TV’s in hotel rooms or common rooms that were clearly built for a different world as one only had 6 station selector buttons and the other 8. They looked as though they could easily be left over from the communist era when information access was more tightly controlled. And linens also are scrimped on: tiny, thin towels and bottom sheets 1-2’ shorter than the bed are common. We do miss the compulsively-clean rooms in most of Austria and Germany. In Hungary as some other countries we’ll often pick-up dust on things we stash on a high shelf, find colonies of dust bunnies under the bed when we check for misplaced belongings, and I plucked 2” long sliver of broken glass off carpeting in one hotel room just before my bare foot found it. But the beds are almost always in good condition, the plumbing as good as much of Europe’s and the host’s are industrious about finding a safe place to stash our bikes for the night. We passed-by the $2/pound watermelons in Austria so our eyes bugged-out at the sight of watermelons at 10 cents a pound in Hungary, of which we have eaten many in this too-hot summer weather. I have yet to understand why sunflower seeds are expensive even though we pedal by vast fields of them in the countryside. And imported foods aren’t as plentiful on the shelves as in EU countries where the tariffs are reduced and we miss the variety and selection because of it. My experience with food prices in Hungary is like the room prices: things are either high or low with little in the middle and with no obvious reason for the variation. Cycling in and around Budapest was harder than we expected from the more welcoming way bikes are treated in western Hungary. We rode a total of 5 different routes in and out of Budapest during our 2 separate visits to the city and on the couple of day trips out of town and none of them were pleasant or easy. 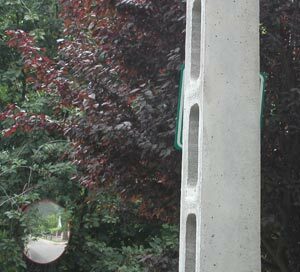 2" separate this post & the green & white bike sign. Our first trip into Budapest was frightening as we quickly learned that the city bus drivers wouldn’t deviate an inch from their course to allow for our presence on the road, unlike the tour bus drivers or public bus drivers elsewhere in the country. The pavement was rough, the shoulders non-existent and our options for getting out of the way were very limited. But they quickly conditioned us to scramble when a bright yellow bus loomed in our indispensable rear view mirrors. Biking within Budapest was literally and figuratively rocky. There are some bike routes, some paved and some not, and some are well signed and others not. At a couple of key intersections we racked up too many extra miles finding the correct jog in the route as we explored the options one-by-one and at length. So, biking in Budapest was do-able but never fun or leisurely like it is along the Danube region in Vienna. We were especially disappointed with Budapest’s efforts with their portion of the long, international Danube bike route. I had expected a carefree, scenic ride out of town along the river on a wide, smooth path. Instead we were greeted with extremely rough, often unpaved surfaces that were rarely along the river and amazingly poorly signed—it was unbelievably slow-going and frustrating for a flat route. We had to be on our toes to spot the few route signs (especially this barely visible one in the photo that Bill saw) and did a lot of backtracking as well. I was eager to take the boat for our final trip out of Budapest so as to avoid the aggravation of biking the Danube route again. On a Saturday night, the second to the last night of the Tour de France, we patiently waited through the unintelligible Hungarian evening news in hopes of hearing how Lance Armstrong had done in the all important time trial. One of the odd rituals in the Tour is that it is the second-to-the-last-day’s performance that seals the fate of the winner, not the last day—tradition has it that the last day is a celebratory ride and not competitive (except for the sprinters.) The Hungarian couple in the common room of our B&B of course changed the setting to the other of the 2 channels just as the Tour news came on. We begged for a switch back to the news, which they very grudgingly obliged. The audio was useless but we peered at the screen to see Ulrich’s and Lance’s final times for the day’s event, as Ulrich was only about a minute behind Lance (an unheard of close race for Lance’s Tour finishes). The video showed their times and it was clear—Lance had lost his lead and Ulrich would be crowned the winner the next day. We had been worried for Lance as in the last video we had seen he looked uncharacteristically pooped and discouraged. And during the day we had ridden fast and hard in the heat for a short stretch of road in honor of the effort we knew he was expending during the event. The rest of the evening and all of Sunday our hearts were heavy for Lance and his unsuccessful bid for his record breaking 5-wins-in-a-row. Then Sunday evening we stopped in at an inexpensive internet shop to do some chores and as we were wrapping-up we checked the Tour news. Needless to say we were speechless when we discovered that Lance had won the Tour. Ulrich had actually crashed in the rain the day before and had not surpassed Lance at all. We are still mystified as to why the TV coverage we saw could be so wrong. In hindsight we presume that the network was showing footage of one of Ulrich’s prior time trial wins in this year’s race, but we can’t imagine why. The news report was hours after the finish line had been crossed for the 2 riders so there seems to be no excuse for running week or 2-week old footage. Previously we had learned in Italy and Greece that we couldn’t rely on the TV video alone to know how the build-up to the war in Iraq was proceeding as they both often showed file footage that made it look like the war was underway when it was not. We had thought something like video of the Tour de France would be more straightforward but were clearly proven wrong. ….Kosice, Slovakia which is the second largest city in the country is the answer. (We arrived in Slovakia on Friday, 8/8.) Kosice is very charming and we are laying over an extra day because of it. There isn’t a lot to fill our sightseeing menu but we have a spacious, pleasing room on the large and lively historic old-town pedestrian zone with a super supermarket a block away—ah, the good life. And though we rarely eat in restaurants we have just discovered a buffet-styled place to eat a heart-healthy meal for about $2 each. And amazingly, the weather has cooled a bit—here’s hoping it lasts awhile. Next we head for the Tatra Mountains, which a fellow US cyclotourist promises will remind us of the lower parts of the Dolomites. Then it’s on to Krakow for our slice through southern Poland. After that we turn the corner and head west hoping to land in Spain for the winter.